Considering the unpredictable nature of UPSC question paper, it’s a tough job to select questions. 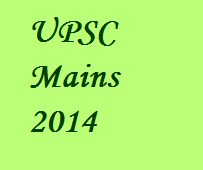 But selections by www.clearias.com turned right for most papers in UPSC Mains 2014. Our strategy was simple – right focus.The strategy was different too – everything Clear IAS provided was FREE. Clear IAS provided free online study materials, guidance and mock tests to equip candidates to clear IAS. ClearIAS.com and Clear IAS mobile app was conceptualized to help and guide students who do not have access to expensive classroom coaching. Don’t give fish; teach how to fish! We stood with our readers/students within the limitations of time, and tried to guide and correct them as per the latest requirements of UPSC Civil Services Prelims and Mains exam. In-spite of the huge size of 2.3 Lakh Clear IAS Facebook followers, Clear IAS Team ensured personal communications as far as possible with all those aspirants who had written to us. We just didn’t always stick to our own convictions but also came up with detailed toppers interviews. The experience and strategies of many toppers including All India Rank 1, Gaurav Agrawal became strategies of thousands in the country. In UPSC Civil Services Exam, because of the tight competition, even 1 mark counts. Clear IAS Team is happy that our convictions turned right on many occasions and there were lot many direct and indirect questions in actual UPSC exam from Clear IAS Mains High Value Answer Writing Program, Clear IAS Mains Full Length Free Mock Tests and Clear IAS free online study materials. Here is the comparison of clearias.com questions with official UPSC Mains 2014 GS3 Paper. [UPSC 2014 Qn] – “While we ﬂaunt India’s demographic dividend, we ignore the dropping rates of employability.” What are we missing while doing so? Where will the jobs that India desperately needs come from? Explain. [UPSC 2014 Qn] – There is also a point of view that Agricultural Produce Market Committees [APMCs) set up under the State Acts have not only impeded the development of agriculture but also have been the cause of food inﬂation in India. Critically examine. [UPSC 2014 Qn] – Foreign Direct Investment (FDI) in the defence sector is now set to be liberalized: What influence this is expected to have on Indian defence and economy in the short and long run? [UPSC 2014 Qn] – “In the villages itself no form of credit organization will be suitable except the cooperative society.” – All India Rural Credit Survey. Discuss this statement in the background of agricultural ﬁnance in India. What constraints and challenges do ﬁnancial institutions supplying agricultural ﬁnance face? How can technology be used to better reach and serve rural clients? [UPSC 2014 Qn] – Capitalism has guided the world economy to unprecedented prosperity. However, it often encourages short-sightedness and contributes to wide disparities between the rich and the poor. In this light, would it be correct to believe and adopt capitalism for bringing inclusive growth in India? Discuss. [UPSC 2014 Qn] – In a globalized world, Intellectual Property Rights assume significance and are a source of litigation. Broadly distinguish between the terms—Copyrights, Patents and Trade Secrets. [UPSC 2014 Qn] – Explain how Private Public Partnership arrangements, in long gestation infrastructure projects, can transfer unsustainable liabilities to the future. What arrangements need to be put in place to ensure that successive generations’ capacities are not compromised? [UPSC 2014 Qn] – Drought has been recognized as a disaster in view of its spatial expanse, temporal duration, slow onset and lasting effects on vulnerable sections. With a focus on the September 2010 guidelines from the National Disaster Management Authority (NDMA), discuss the mechanisms for preparedness to deal with likely El Nino and La Nina fallouts in India. [UPSC 2014 Qn] – The Right to Fair Compensation and Transparency in Land Acquisition, Rehabilitation and Resettlement Act, 2013 has come into effect from Ist January, 2014. What are the key issues which would get addressed with the Act in place? What implications would it have on industrialization and agriculture in India? Thanku sir for your wonderful help to all the aspirants . you are requested to start the same course soon for next year mains .